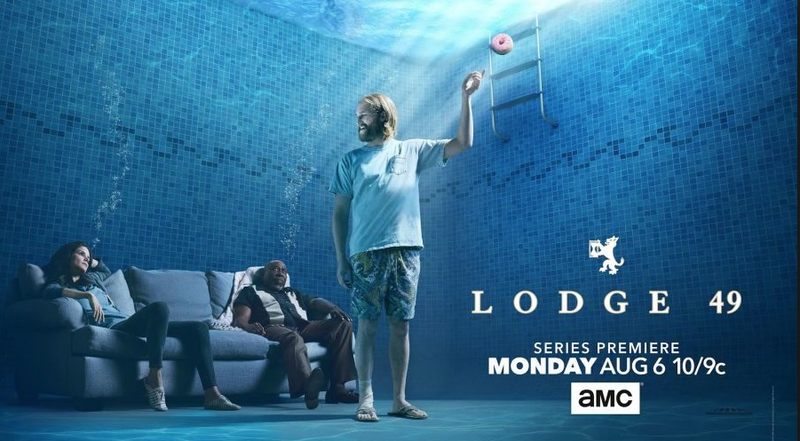 Saying that Lodge 49 is literal or realistic about anything seems strange. If people know anything about the show, and few do, it is that the show has a kind of hazy dream logic that borders on the fantastical, with references to ancient orders, alchemy, and even a dragon. It is, however, also a show about factory closures, debt, and the rise of service and temp work. Or, more to the point, the show's strength is in how it combines fantasies about arcane secrets with mundane maters about work post-industrial America. 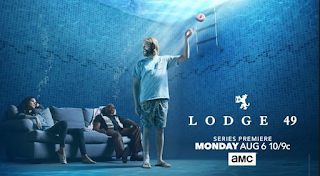 The plot of Lodge 49 primarily concerns Sean "Dud" Dudley. Dud is a affable California surfer type, so devoid of pretension that he does not seem to even notice that his nickname would seem to be an insult. Dud is always presented as someone content with his lot in life, one could even say he "abides". Before the show began he was living his version of the American dream. He worked for his father's pool company repairing pools, surfed, and hung out with his father and sister at night. It was not a huge dream, but it was his dream. All of this fall apart in series of calamities that started with Dud getting bit by a snake while surfing in Nicaragua, his father's mysterious disappearance while body surfing, and, most importantly, the realization that the pool company was floating on a sea of debt. With the death of Dud's father all of this collapses; the house is repossessed by the bank, the pool company is closed and sold off. The show begins with Dud homeless and adrift, no job, no place to belong; he can't even surf due to a lingering injury left from his snakebite. Lodge 49 is set in Long Beach, California specifically a Long Beach that is losing its last major industrial employer, Orbis an aircraft factory tied into cold war contracts and prosperity. All that is left in its wake are strip malls, temp work, care work, and real estate speculation. 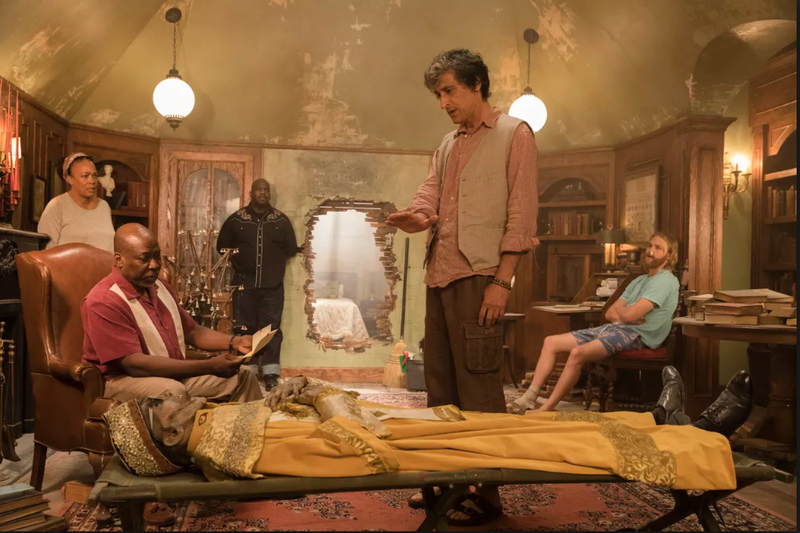 Despite this "ripped from the headlines" image of the present, history appears radically forshortened on Lodge 49. Lodges, social clubs, and other forms are presented as if they are part of the recent past, and not, as is often the case a remnant of those peak years of productivity and suburban community that ran from the fifties through the early seventies. "Bowling Alone" was first published as an essay in 1995, and detailed a decline in civic engagement that began to take off in 1973. The show seems to take place in an America that skipped directly from the late sixties of steady Fordist employment to the present age of temp jobs, condensing all of the years in between. The strip mall even appears as a kind of remnant of a small town complete with a misery villain. The most prosperous business in the strip mall is a pawn shop/loan shark, who puts a personal face on debt. Dud owes money to him as do other characters. This forshortened history leads to some odd displacements. Ernie Fontaine, the leader of the Lodge, is introduced as a Navy vet, but he is a veteran not of the Great War, but of the US involvement in Bosnia, or as he puts it with a combination of pride and bewilderment, "I was fighting ethnonationalism." The latter half of the twentieth century collapses so easily because it was all just a repeat of the first half. As inaccurate as this forshortened history is it matches a mediascape that is constantly framed between Baby Boomers and Millennials with everything between the two collapsing in a kind of haze. When the show begins Dud is left adrift searching for not just a new job but a new sense of purpose. His sister, Liz is left to deal with the debt. Liz and Dud have their own gendered dynamic described by their nicknames "Sister Nag" and "Brother Drag"; she is the responsible and sensible one, while he is the laid back and affable one. She takes a job at Shamroxx, a "breastaurant"; the cash tips help her avoid the banks attempt to garnish her wages. The show is less interested in the particular dynamics of sexuality and labor that defines a breastaurant (for that I would recommend Support the Girls) than in presenting working their as a particular kind of dead end. Liz is a woman without illusions or dreams. She lives to pay off debt, hers, her brother's, and what was left by her father. When she is not working she watches reality television, mocking the idiots who believe in dreams beyond the grind of working and paying debts. When she dreams, she just dreams of a day spent at work, a dream terrifying in its utter ordinariness. Liz has grimly accepted the reduction and destruction of her life to nothing more than working, to paying down her debt dollar by dollar. To paraphrase Deleuze, "a woman in debt is a woman confined," only the cage is internal, a reduced sense of what is possible or even desirable. "When communist workmen associate with one another, theory, propaganda, etc., is their first end. But at the same time, as a result of this association, they acquire a new need — the need for society — and what appears as a means becomes an end. In this practical process the most splendid results are to be observed whenever French socialist workers are seen together. Such things as smoking, drinking, eating, etc., are no longer means of contact or means that bring them together. Association, society and conversation, which again has association as its end, are enough for them; the brotherhood of man is no mere phrase with them, but a fact of life, and the nobility of man shines upon us from their work-hardened bodies." "These are good people, who’ve fallen on hard times! It’s the fate of the working class! Or perhaps the middle class? Things are little more fluid here. It’s difficult to distinguish who’s who. But I do know that the more technology isolates us, the more we need places like the lodge. For the first time, I truly see what it means to be a Lynx. It means community, and brotherhood." It is possible to read the show as a search for community in an age that undermines it, technologically, economically, and socially. In a society that makes social relations the means to individual ends, what else is networking, social life independent from any self interest, freed from the constraints of work or consumption, is as fantastic as a unicorn. However, there is another reversal at the heart of the show. The narrative structure of Lodge 49 moves through a series of what could be called quests. Ernie (the Lodge leader that takes Dud under his wing) chases after a real estate developer called Captain with the hope of making a huge sale of plumbing supplies to his the new condo development. Captain in turn is pursuing a dream of the oil that supposedly is untapped beneath the defunct Orbis factory. Or perhaps it is less of a dream and more of a scam. Liz chases a dream of a corporate training program only to find that this program is headed by an odd management guru that spouts empty bullet points and assigns Capital to her trainees. Every quest for prosperity finds itself turning more and more towards myth and fictions. Perhaps modern capitalism is not so far from the search for the philosopher's stone, for something that can instantly turn lead to gold without the intermediary of work.